Hannah is an experienced UK mountaineering Instructor and International Mountain Guide – with a real “Passion for the Mountains”. Infact this is the title of Hannah’s recently published book which brings together articles by members of the British Mountain Guides Association recounting some memorable adventures in the mountains. Hannah has a talent for creating exciting & challenging yet appropriate itineraries for teams of different ability levels and is able to use her knowledge of the French, Swiss & Italian Alps as well as extensive training experience to deliver great courses for guests in the mountains. 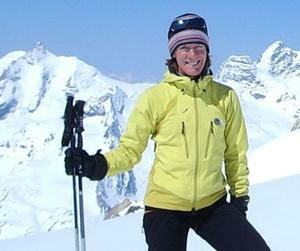 After 25 years of climbing & skiing from a base in the Scottish Highlands Hannah has had a wealth of mountain adventure experience herself and now continues to enjoy Guiding, Climbing & Skiing from a base in the Mont Blanc Massif. Thank you for an amazing few days touring! Your guidance, patience and words of wisdom were very much appreciated. The route choices were pitched to perfection being both challenging but achievable. It has certainly, as I hoped opened by eyes to the world of ski touring/mountaineering. Thank you both again for a fantastic few days, I am already thinking about next year.. Thanks for organising a great 6 days in the mountains! Brilliant guides (I don’t know how Hannah put up with us!) and a great itinery, the Tete rouse/Gouter combination proved to be perfect! So pleased we all managed to summit MB, (even with my blisters – I had to hire different boots!) such an improvement over last years guiding.